FM 105 Hot Karachi. FM Radio Live 105 Hot Karachi is presently working in Karachi City with best quality service and providing best information and quality programs for the peoples of Pakistan and daily updates every day. FM Radio 105 Hot Karachi is the Hottest and interesting FM Radio Station of Pakistan and so much popular all over the whole country for its quality programs, specially peoples like this FM Radio on Internet. You can also like FM 105 Hot Hyderabad and also FM 101 Karachi. It telecasts their live programs in 105 MHz frequency. 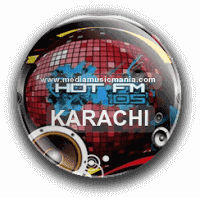 FM 105 Hot Karachi Radio cover the major towns in the Karachi such as Liaquatabad , North Nazimabad, Gulberg, Gulshan , Korangi, Landhi, Shah Faisal, Lyari, Saddar, Jamshed, Kemari, SITE, Baldia, Orangi Town, Its head office is located in Karachi, Sindh, Owned and operated by Infotainment World (Pvt.) Ltd. This FM Radio is providing best and excellence service in all over Karachi and FM 105 Hot Hyderabad. This Radio is source of information for most of Rural and part of Sindh areas. In all these areas, FM 105 Hot Karachi Radio is listened. This FM Radio is Broadcasting very fine Quality service and the sound is very clear and fine to listen the peoples of Karachi and Pakistan who live in far flung areas. Listen online FM Radio Music, this FM is very popular in all over Karachi and surrounding areas. FM Radio Pakistan is broadcasting many entertainment programs such as Classical Music and Pop Music.